On your journey from Segovia’s Roman aqueduct to its Plaza Mayor, you’ll no doubt pass by one of the city’s most intriguing buildings, the Casa de los Picos. One look at the façade and you’ll easily see how it earned its name, the (loosely translated) House of Sharp Points, as its front is covered top to bottom with over 600 granite, diamond-shaped reliefs. It is believed that the 15th century noble home’s curious façade was created as a possible form of defense given the building’s rather exposed location. Legend has it, though, that the house was well known (famously or infamously) for its previous owners, so when new ones moved in, they chose to cover the façade. 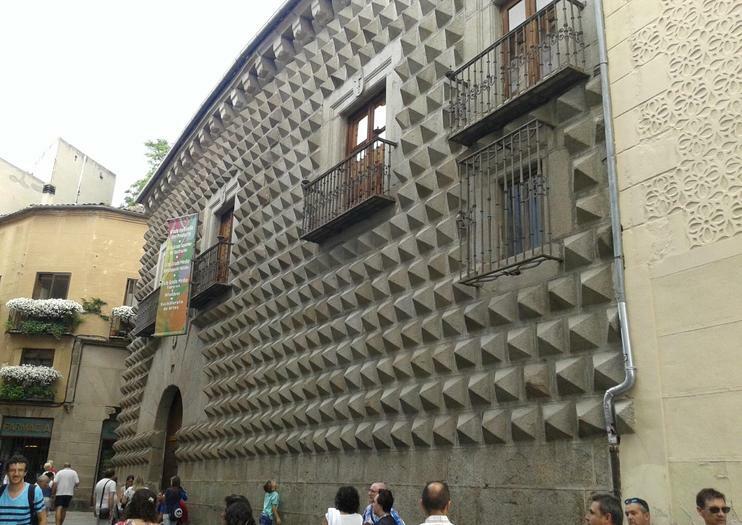 These days, the thick-walled structure is home to the Segovia Art School and serves as an exhibition hall, which is open to the public free of charge. While opening hours are sparse, there isn’t much to see on the interior, so most will get their fill by viewing the exterior. Hours: April 1st-September 30th: Monday-Sunday, 12 a.m.-2 p.m. and 7 p.m.-9 p.m. October 1st-March 31st: Monday through Sunday, 12 a.m.-2 p.m. and 6 p.m.-8 p.m. Combine visits to three UNESCO World Heritage Sites in a single tour from Madrid. With all transportation provided, this multi-stop tour in Segovia is made easy and there's no need to rent a car. Your guide will provide insightful commentary as you visit Segovia's historic old town, El Escorial, and the Pantheon of Kings. Spend the day exploring Segovia on this private trip from Madrid. Check out the top attractions and learn about the Roman aqueduct, royal palace and more from your friendly, professional guide. Customize this trip to meet your time constraints and interests, and ensure that you leave having seen the best of these two destinations!